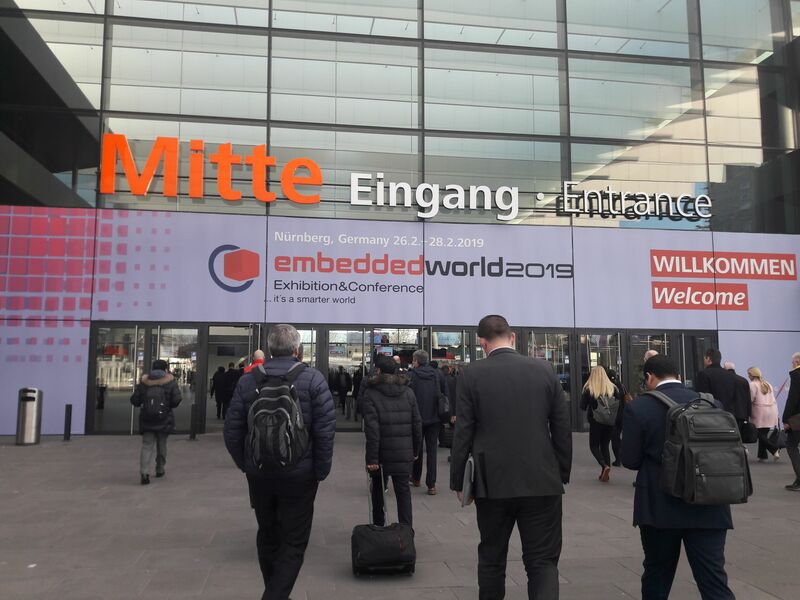 Auch in diesem Jahr war basysKom auf der Embedded World und der begleitenden Fachkonferenz vertreten, welche vom 26. bis 28. Februar in den Hallen der Nürnberg Messe stattfanden. In ihrem 17. 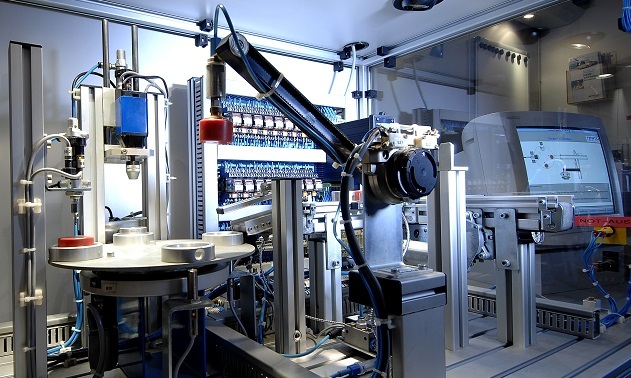 Veranstaltungsjahr deckte die internationale Leitmesse mit einer Vielzahl an Ausstellern wieder die gesamte Bandbreite der Embedded Systeme ab und verzeichnete zahlreiche Fachbesucher. Die Anzahl der Aussteller und auch der Besucher erreichten Rekordniveau. Trendthemen in diesem Jahr: KI, Safety and Security, ebenso wie HMI, M2M, Open Source, Edge und Cloud Computing. An unserem Stand konnten sich Interessierte anhand unseres neuen Showcases aktuelle Entwicklungen im Bereich der digitalen Industrieproduktion zeigen lassen, sowie anregende Diskussionen mit unseren Fachleuten führen. Ein besonderes Highlight bestand hier in einer im Showcase integrierten Sprachsteuerung, welche die Automatisierung der Produktionsstraße durch einen hands-free Workflow optimiert. Im Bereich des Cloud Computing boten wir unseren Besuchern eine Remote-Monitoring Anwendung. Diese war aufgebaut auf der Cloudtechnologie Azure von Microsoft und dem WebApplication-Framework Angular. Auch an der begleitenden Konferenz beteiligte sich basysKom mit zwei Vorträgen. 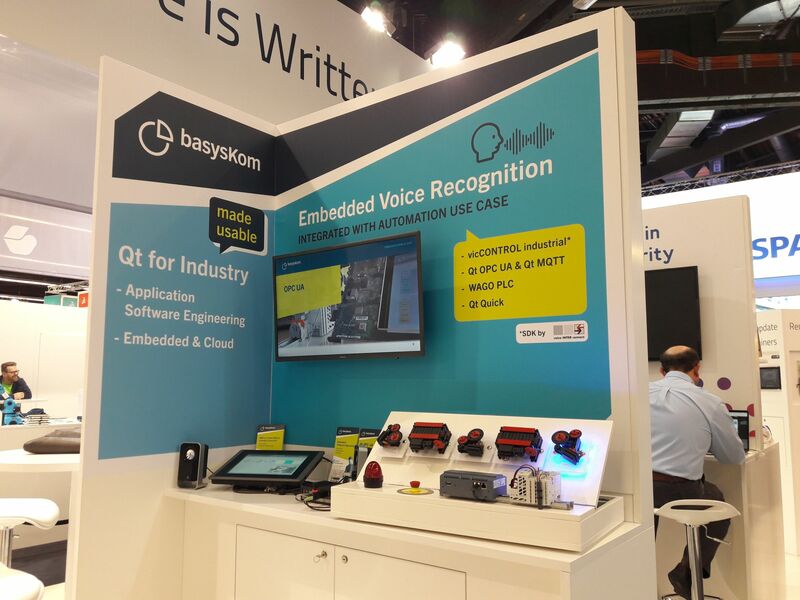 Bei diesen referierten wir über die Erstellung von Embedded Computer Vision Applications mit Qt und über die Applikationsentwicklung mit der Open Source-Implementierung open62541 nach OPC-UA-Standard. An OPC UA server supporting historical access allows clients to access historical data or historical events. Such a server can act as a process or event historian. open62541-based servers were till recently completely missing the ability to support these use cases. 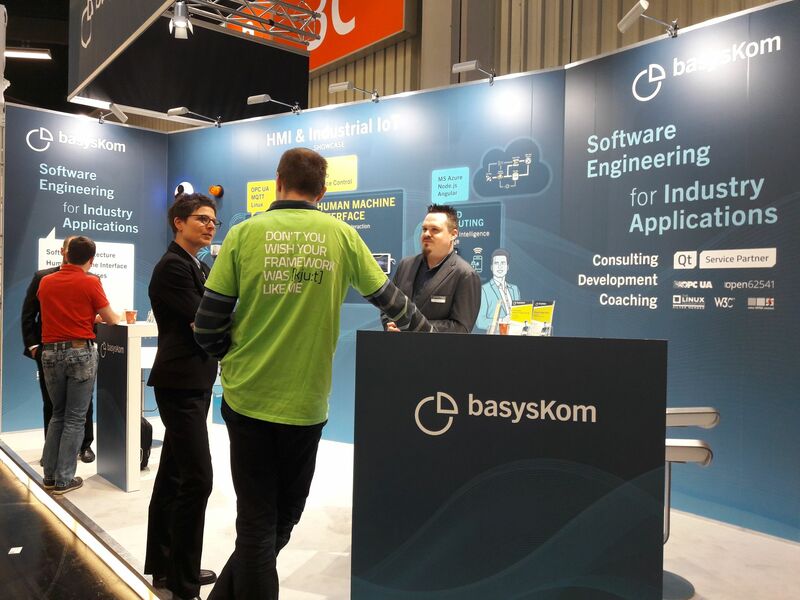 basysKom has extended the server API to support access to historical data using the “read raw” functionality specified in OPC UA part 11. This allows to create a simple process historian. This article provides an overview about this API and a short tutorial how to use it. Most of the new functionality is contained within a plugin called UA_HistoryDatabase. This plugin contains three main API elements. UA_HistoryDatabase (same name as the plugin) which contains the main interface between the server itself and the plugin. UA_HistoryDataBackend which implements the integration with a specific database. A sample implementation based on a simple in-memory database is provided. UA_HistoryDataGathering which encapsulates the gathering and storage of data. The following diagram gives an overview how these API elements interact. The following tutorial will first demonstrate how to create a simple server, hosting a single variable node. We will extend this server to store this value in an in-memory database each time it changes. The resulting server can be browsed and the variable can be read. We use UAExpert for this tasks. We now extend this example so that the server will be able to handle request for historical values for this node. Each of the following snippets contains enough context so it is clear where to add the code into the initial server code. // Instanciate a UA_HistoryDataGathering with an initial node id store size of 1. // The store will grow if additional nodes are registered, but this is expensive. Next we configure the node to update the database each time the nodes value is set. /* Use the default sample in-memory database. Reserve space for 3 nodes with an initial room of 100 values each. /* We want the server to serve a maximum of 100 values per request. Again we rely on the UAExpert to validate the server. First update the variable a few times (so we actually have some historical values). Next we want to read them. For that we use the “History Trend View” which is available via Document → Add → Document Type. The resulting view shows either a graph or (in a second tab) a list of your historical values. If no values are plotted or the list is empty make sure that the right time interval is used in the request. It is now possible to create open62541-based servers which support the gathering and reading of historical data values. A number of plugin interfaces has been defined which can be used to implement functionality such as support for additional databases (e.g. sqlite). There is additional work to be done to support other history read details such as “read event”, “read modified”, “read processed” or “read at a time”. Also the history update service still needs to be implemented. In addition to being a contributor to the project, basysKom also provides commercial support for the open62541 OPC UA stack. Talk to us if you are interested in project/application support, the implementation of missing features or bugfixing. 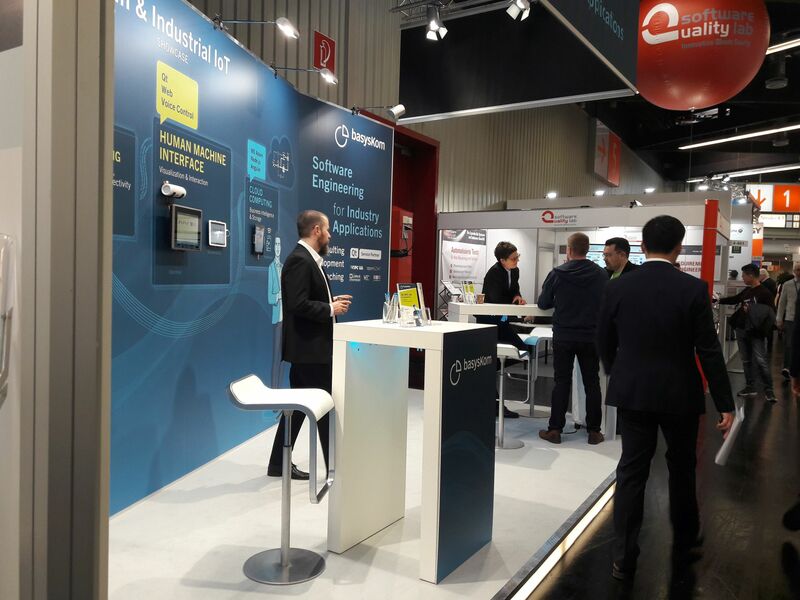 Diskutieren Sie mit uns an unserem Stand in der Halle 4, Stand 400 oder als Partner bei The Qt Company, Halle 4, Stand 258, über aktuelle Themen in der Entwicklung von HMIs und Anwendungen für technische Aufgaben und freuen Sie sich auf unseren neuen Showcase. Wir zeigen – von der Steuerung bis in die Cloud – Digitalisierung im Kontext einer industriellen Produktionsstraße. Als besonderes Highlight haben wir dieses Jahr eine Sprachsteuerung in unsere Industrial HMI integriert. Damit werden hands-free Workflows auch an der Maschine möglich. Auf der Cloud-Seite zeigen wir eine Remote-Monitoring Anwendung basierend auf Microsoft Azure und Angular. 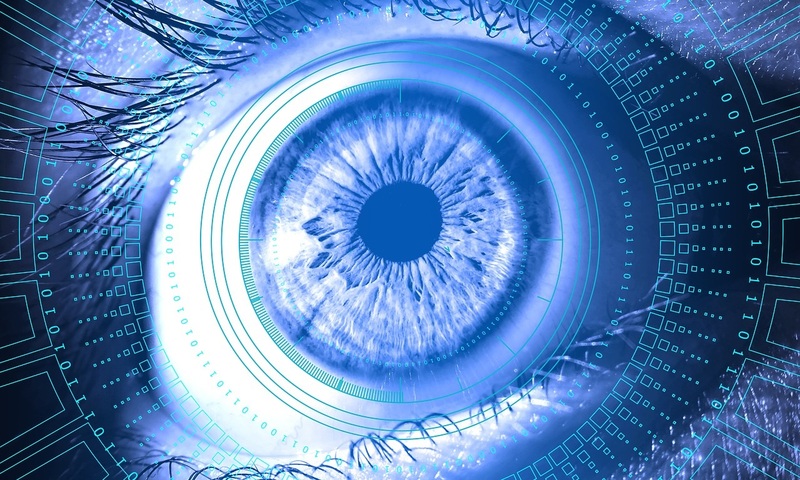 In dieser Präsentation wird dargestellt, wie komplexe HMIs für Computer Vision-Anwendungen mit Qt erstellt werden. open62541 ist eine freie und Open Source-Implementierung des OPC-UA-Standards. Nach einem Start im größtenteils akademischen Kontext sieht es in kommerziellen Projekten immer mehr Akzeptanz. Sichern Sie sich mit uns eine kostenlose Eintrittskarte indem Sie sich einfach bei uns melden. Wir freuen uns auf Ihren Besuch! With the release of Qt 5.12, Qt for Python is officially supported and can be used to write full-fledged Qt applications using Python as the main programming language (https://blog.qt.io/blog/2018/12/18/qt-python-5-12-released/). This prompted us to also take a closer look at the bindings (the Python module is called PySide2) and also the underlying technology, namely the binding generator called Shiboken2. This post will show you how to create a set of Python bindings for a small Qt library from scratch. The Qt bindings themselves are easy to install and use. If you have a python interpreter and the pip package manager set up on your system, whether it is Windows or Linux, you can install the module via pip install PySide2 and are ready to go. 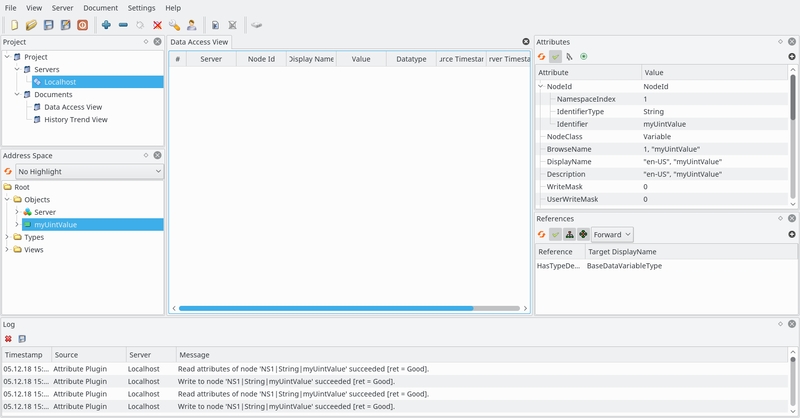 While it is nice to use the Qt framework from Python it is even better to be able to quickly create Python bindings for your own Qt libraries and use their API from Python with relatively little work. All examples on this article have been run on Ubuntu 18.04, the setup steps for other platforms might vary. Since the most recent documentation advises to build Shiboken2 from source for building your own bindings, we will do that now. 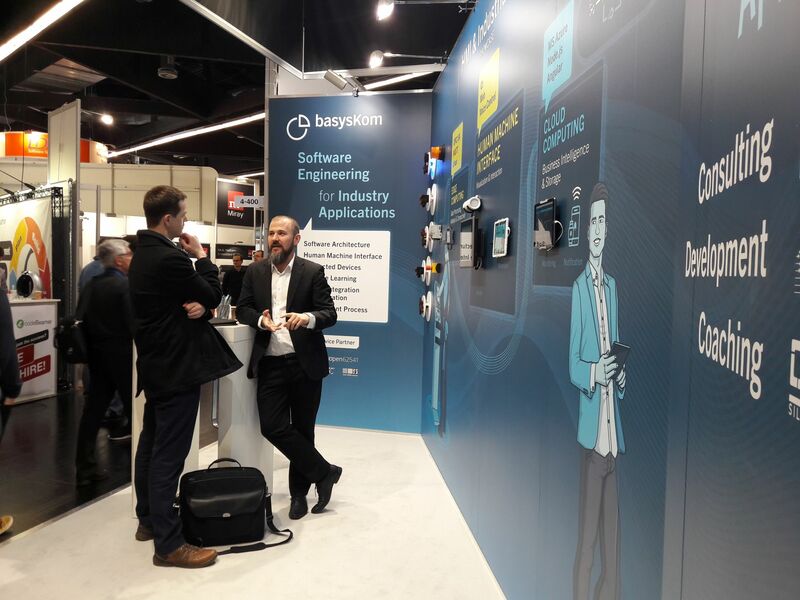 basysKom wird auch in diesem Jahr auf der “Konferenz Internet of Things – vom Sensor bis zur Cloud” am 25.10.2018 in München als Aussteller diesmal mit einem Industrial Azure-IoT Showcase vertreten sein. 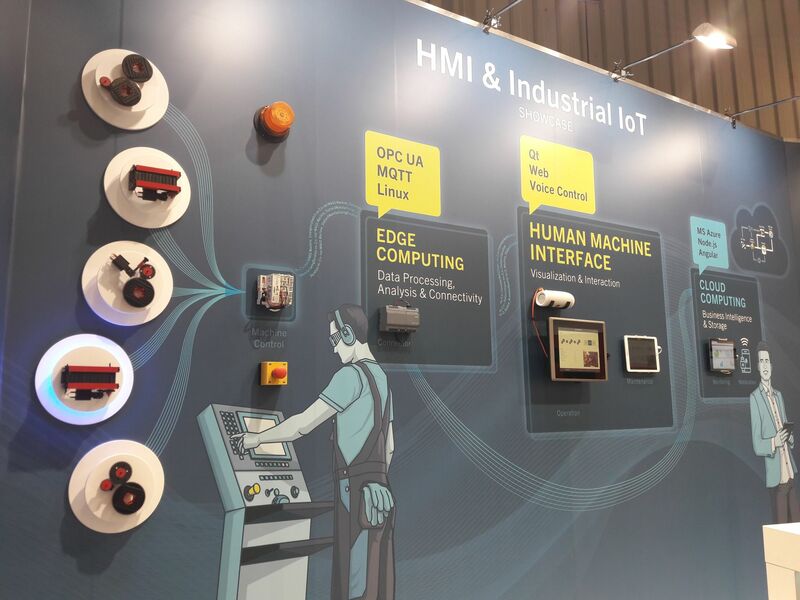 Driven by topics such as Industry 4.0 and IoT, OPC UA has established itself as the de facto standard for the communication of industrial devices and applications. 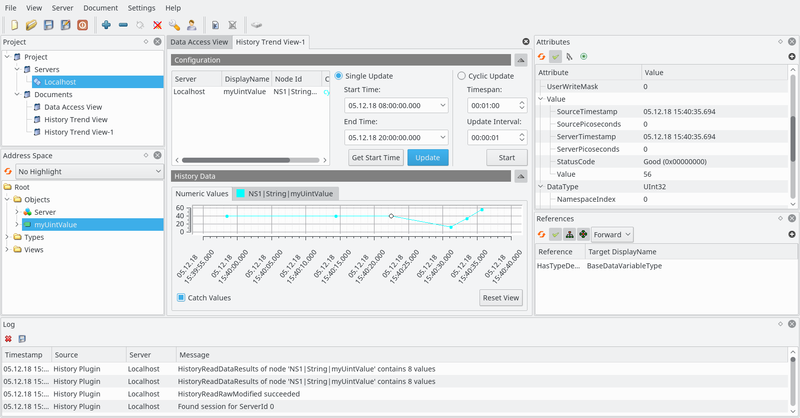 Qt 5.11 ships with Qt OPC UA, a new module which has been developed by basysKom, together with The Qt Company. 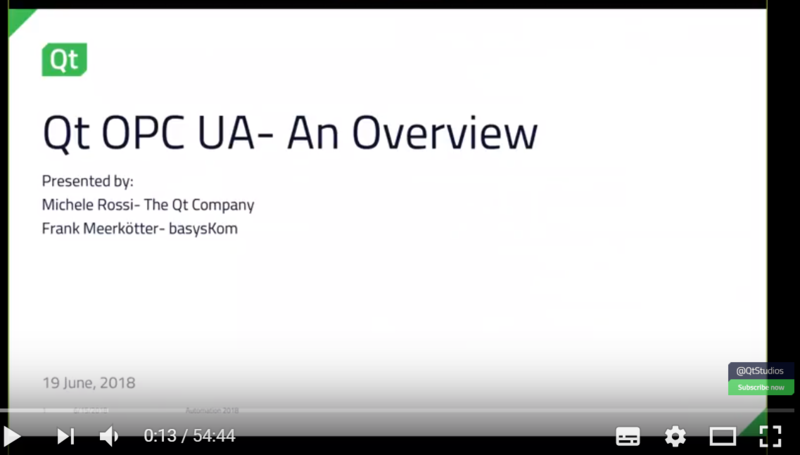 Qt OPC UA enables out of the box integration of OPC UA enabled devices with Qt applications. Take a look yourself on youtube or at the slides.